Crime affects everyone and everyone wants crime to stop. One of the most important things that help with the fight against crime is the Community Policing Forums. These Forums operate at grassroots level within communities and work closely with the police. In many townships, crime has been reduced as a result of this joint effort. Community Policing Forums' Board Chairman in Gauteng, Zacharia Motaung, told Vuk'uzenzele that the Forums help police with information that can help prevent crime or find wanted criminals. For example, the good working relations between the Forums and the police have led to the arrest of a number of criminals and helped police to find stolen goods. "We are trying hard to create a crime-free society, and we are winning. This is good news for all," he said. Residents appoint members of Community Policing Forums. Therefore the Forums represent their communities. "These people are just volunteers. 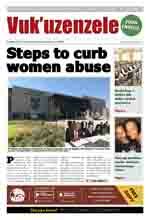 We must be proud of their work and their contribution towards making our country safer," Motaung said. In Gauteng, the Department of Community Safety helped 12 police stations to set up Community Policing Forums. Every Forum has 15 executive members. The Forums have become very important in the fight against crime, said Tebogo Lebudi of the Gauteng Department of Community Safety. The Forums are not the police, but they serve as "the eyes and ears" of the police, he explained. In Reiger Park on the East Rand, gang violence has left many people dead. Since a Community Policing Forum was started there last year, its members have helped recover a lot of stolen goods and unlicensed guns. It also helped with peace talks between gangsters, he said. In townships like Vosloorus and Tembisa the Forums have helped to reduce crimes like domestic violence, taxi violence and robberies. To help members of the Forums to improve their skills, the department is assisting them to attend training programmes, like conflict resolution and management, Lebudi said.